School choice advocates from across the country on Friday urged Mainers to allow taxpayer funds to pay private and charter school tuition, increase teacher accountability, student testing, and the number of ways in which a person can become a certified teacher. AUGUSTA — School choice advocates from across the country urged Mainers to transform the state’s public education system by allowing taxpayer funds to be used to pay private and charter school tuition, and to increase teacher accountability, student testing, and the number of ways in which a person can become a certified teacher. The advocates, many of them from Florida and Indiana, made their cases at Gov. Paul LePage’s education conference Friday at Cony High School in Augusta before an audience of more than 200 legislators, school officials, and interested members of the public. 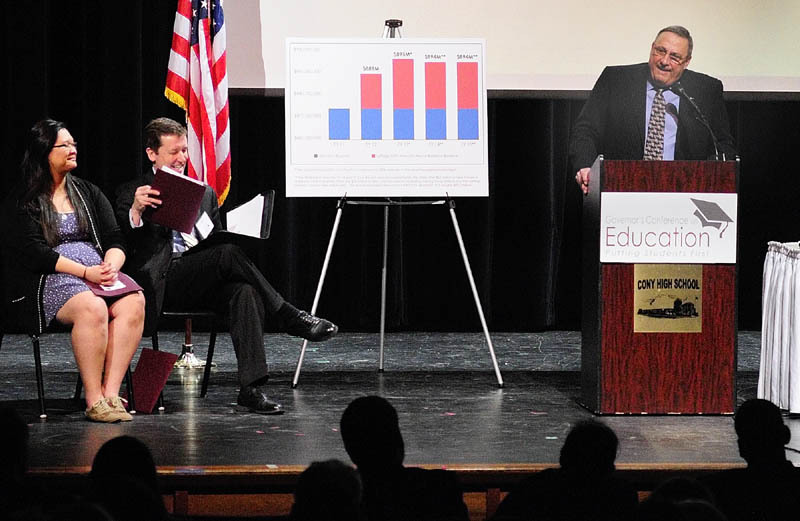 Invited panelists urged Maine policymakers to think of public education in terms of education that is publicly financed, but not necessarily taking place at public schools. Florida Education Commissioner Tony Bennett, who gave the keynote address, warned education-reform advocates in Maine to take lessons from his tenure as Indiana’s top education official. Bennett said he was both a success and a failure as Indiana’s state superintendent. With support from a Republican governor and legislature, Bennett led the charge for several education reforms, but alienated many educators and lost re-election last year in an expensive, nationally watched campaign. Bennett said reformers need to change their rhetoric and work with teachers. The conference was about ideas to improve public schools in Maine, but some school leaders said they thought the conference was too prescriptive and didn’t provide a voice for people actually working in or running those schools. Cony High School teacher Jeff DeJongh, president of the Augusta Education Association, criticized the decision to hold the conference on a school day, which meant that he and other Cony teachers couldn’t attend, even though it was in their building. The conference, titled “Putting Students First,” featured reform advocates from Florida, Indiana and Washington, D.C., talking about the policy changes they’ve made in their states or advocate nationwide. The conference attendees also heard from Cony High School senior Michelle Zhang, Deering High School sophomore Mohamed Nur and Thornton Academy Head of School Rene Menard. Located in Saco, Thornton is one of 10 private schools in the state educating at least 60 percent publicly funded students. In his opening address, LePage said he was inspired to launch the conference after attending the November 2012 national education summit convened by former Florida Gov. Jeb Bush and his Tallahassee-based Foundation for Excellence in Education. 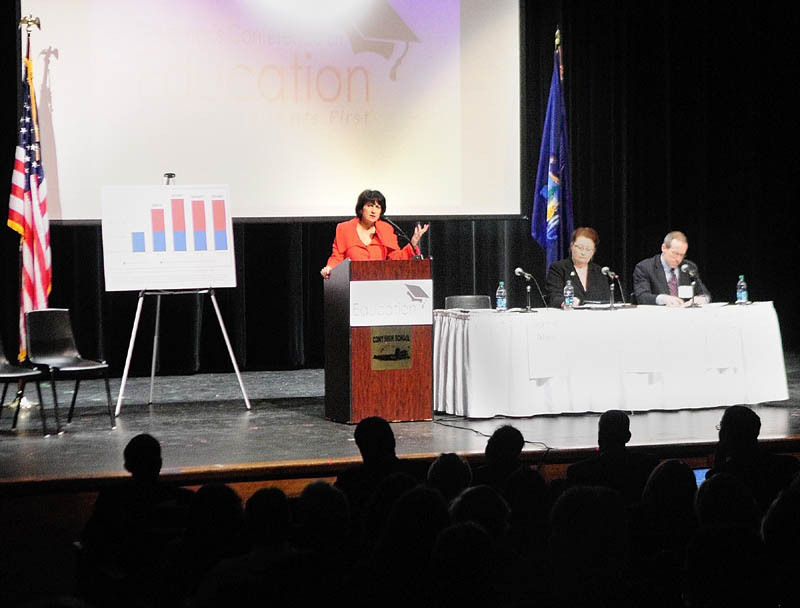 The foundation has heavily influenced the LePage administration’s education agenda. Correspondence acquired through public records requests has shown that Maine education commissioner Stephen Bowen has often turned to the foundation for advice, draft laws and other support on initiatives the foundation supports. Most of the presenters had appeared at Bush’s conference or worked for his foundation, including Bennett, Kate Walsh of the National Council on Teacher Quality and Jeanne Allen, president of the Center for Education Reform. The panelists at the conference pushed a reform agenda that hews closely to policies LePage and Bowen have already promoted: charter schools, virtual education, vouchers, evaluations and accountability for teachers. Allen said Maine has been “late to the party” in implementing reforms that give students more options. Even though charter schools are now allowed, the Maine Charter School Commission is acting too slowly to authorize them, she said. Many opponents of charter schools, vouchers and other school-choice programs say they take money away from traditional public schools. Teachers’ unions and critics believe the Florida model’s goal is to privatize public education and enrich companies that would capitalize on the changes. But Leslie Hiner said it’s not helpful to view education funding as a zero-sum game. Hiner is vice president of programs and state relations at the Friedman Foundation for Educational Choice, an Indianapolis-based advocacy group founded by conservative economist Milton Friedman. Another panel discussion focused on teacher quality. Maine adopted a law last year phasing in evaluations for teachers and principals that will include data on student achievement growth. The law allows the evaluation results to be used in decisions about dismissals and compensation, as advocated by groups like the National Council on Teacher Quality and Students First that sent representatives to the conference. Three senior officials from the Foundation for Excellence in Education touted the results of Jeb Bush’s education reforms. The foundation, founded by Bush, has played a role in shaping Maine’s digital education policies. Starting in 1999 under Bush, Florida began giving each school letter grades, a move LePage advocated in his State of the State address last month. The state also offered vouchers for students at failing schools, held back third graders who failed a state reading test and funded Advanced Placement tests for students. Between 1992 and 2011, Florida ranked second to Maryland in the amount of growth in student scores on the National Assessment of Educational Progress, while maintaining the lowest rate of growth in spending on education. While Florida students still perform below Maine students on most measures, Matthew Ladner, senior adviser at the Foundation for Excellence in Education, said Florida’s results show the value in the reforms the state has made. “Florida still has plenty of issues to work out, but what Florida has proved is that demography is not destiny,” Ladner said. LePage said Florida’s success is important to note because the state has many students who are poor, speak limited English or face other challenges. Bennett said that as state superintendent in Indiana, he took a lot from the Florida model, such as letter grades for schools. During Bennett’s tenure, Indiana also instituted the country’s largest voucher program and limited collective bargaining to wages and benefits so union contracts can’t set layoff procedures. After Bennett lost his race for re-election, Florida Gov. Rick Scott appointed him to Florida’s top education job. Bennett said he favors grading schools on finances as well as academic achievement and will work to make sure that all of Florida’s education reforms are working cohesively. Bennett said he used the wrong rhetoric in Indiana and that school choice should be seen as “the social justice issue of our generation.” He said that he and his wife could buy a house in a neighborhood with good schools or, failing that, pay the tuition for a private school. Bennett said he was “a dismal failure” at building a coalition of support for education reform. He challenged LePage and Maine education leaders to debate civilly and bring ideas to the table in good faith. He also advocated for local control, saying that the role of a state education agency is not to dictate practices but share the best ones. Even before Bennett’s remarks, however, it was clear that some people in attendance felt they were being overlooked. “It’s not what Maine students need, and it’s definitely not what Maine parents and the public wants in Maine,” she said. 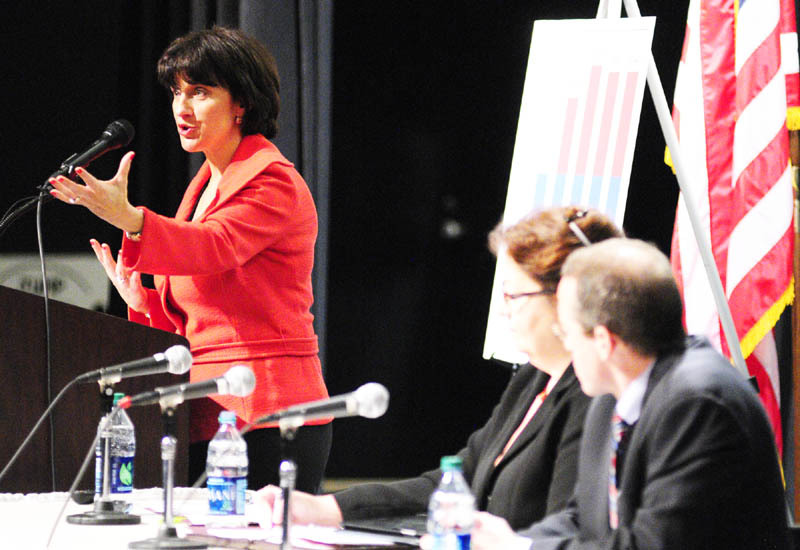 After the conference, Fles, the school board chairwoman from the Gardiner school district, said it would help foster a civil debate if LePage and other policymakers acknowledged that Maine public schools are actually above-average. 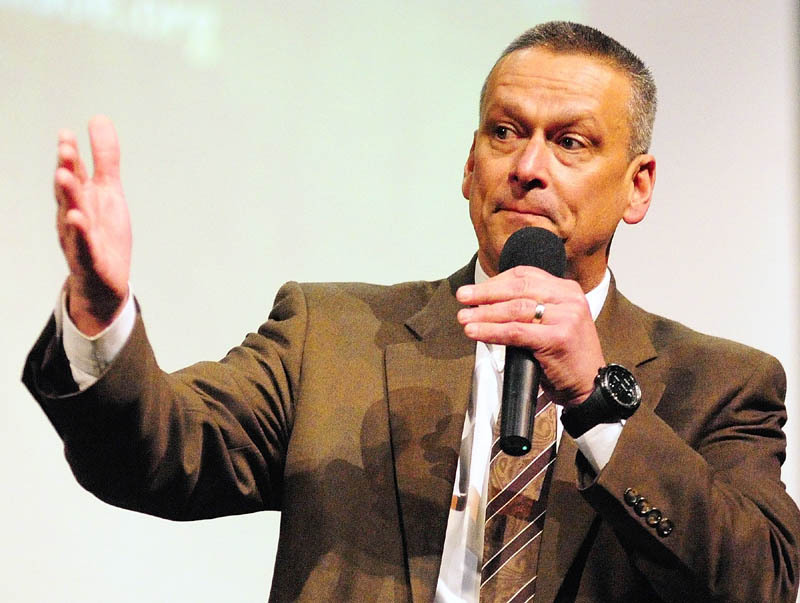 Gary Rosenthal, superintendent of Alternative Organizational Structure 97, which serves Winthrop and Fayette, said after the conference that he could be a proponent of school choice if it’s operated smoothly without hurting schools. Rosenthal said the speakers didn’t provide enough information about the “meat and potatoes” of some of the policies discussed, such as how Florida schools intervene with struggling students to make sure they can read by third grade.